A few months ago when I got the call that Woman’s Day wanted to send a photographer to photograph me and my garage, I kind of freaked a little. I mean, it was my garage, the least attractive room in our house! Part of the unattractiveness stemmed from my workbench with a huge gaping hole in it. 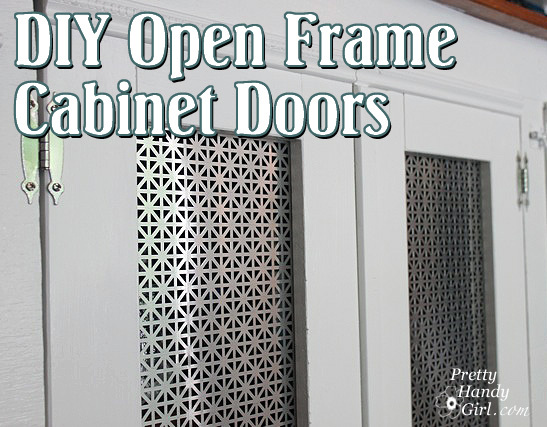 Come on in the workshop and I’ll show you how I built these open frame cabinet doors. Cut four 1″x4″ pine boards to the height of the opening (minus 1/4″). Lay the four boards into the cabinet opening. Center the middle two boards on the center of the hole. Lay the hinges between the two outer boards and the edge of the hole in the cabinet. This will allow room for the hinges when the doors are installed. Measure the width between the outer and inner boards. The measurement should be the same on both sides. Cut four 1″x4″ pine boards for the tops and bottoms of the doors using the width measurement you just took. Clamp the cabinet door together. Use your drill to drive kreg screws into the pocket holes and secure the top and bottom of the frame to the sides. Attach the hinges to the face frame of the workbench cabinet. Insert the open frame door into the cabinet hole. Use shims to raise the frame slightly off the base. Use a level to make sure the cabinet door is level. Then attach the hinges to the door. By the way, Irwin just sent me that little Series 250 Magnetic Torpedo Level and this little guy really rocks! It has more bells and whistles than I’ll ever use. (Like earth magnets for holding it against metal. And a 1.5 degree button for setting drainage pipe. A handy girl never knows when she’ll be laying drainage pipe next!) But, mainly it works great for tight spots when you want to make sure your doors are level. Optional: The top of the workbench opening wasn’t a perfectly straight cut, so I decided to add a little decorative moulding to the top to hide the imperfections. Cut the piece of mounding to the same width as the cabinet door. Add some wood glue to the back and then secure the trim with finish nails. I also cut another piece of mounding to hide the center gap and secured it the same way to the side of one of the doors. Double check to make sure that the doors fit and open and close properly. Remove the doors and prime and paint the cabinet door frames. After the paint dries, measure and cut radiator screen to 2″ larger than the frame opening. Secure the radiator screen to the back of the cabinet frame with the staple gun. Any staples that don’t sink all the way in can be tapped in with a hammer. Re-install the cabinet doors and admire your handy work! Now you see it, now you don’t! Attractive open face cabinet doors to hide your junk. What do you think? Better than fabric? Can you think of anywhere that you could add open faced cabinet doors? They’d make great speaker cabinet doors or privacy screen. The worst bit of craftsmanship I have ever seen, stick to sewing. ? Um, wow, just wow. Why the negativity? I’m sure with Brittany’s skills, if she wanted to make these up to par with say, kitchen cabinetry with inset panels, she would have. but these doors were for a work bench in her garage. I don’t know anyone else that has “pretty” cabinets in their garage for a workspace. That would be silly considering the amount of abuse they could be facing. These look perfectly sturdy and nice to boot. Good job, Brittany! !